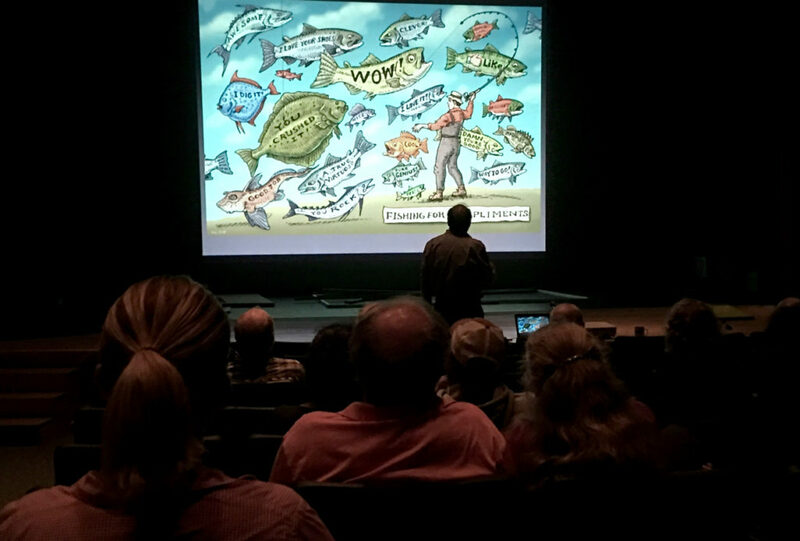 Ray Troll, beloved artist of the Vinalhaven fishing community, visited the island last month. Troll, who hails from Ketchikan, Alaska, makes bold art with a message- often about fish. 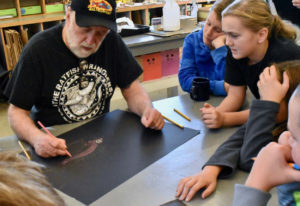 He presented his artwork to students at Vinalhaven School and the community. Troll presented to grades K-5 in an assembly at the school, and also visited the Art Room at VHS, sharing his story and process with middle and high students in teacher Heather White’s class. 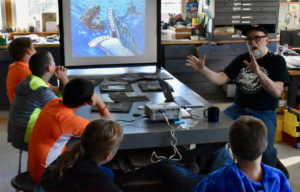 “It was a great opportunity for students to listen to a working artist talk about how he got to be where he was,” said Heather White. The students were very interested in Troll’s style and history. Troll’s technique of colored pencil on black paper lined up with a project the sixth graders were working on at the time, so it was a real added bonus, White said. Students thought that Troll was “really cool” and had a lot of fun listening to him tell his life story and about how he became an artist. A community presentation was also held in the evening. Troll’s humerous presentation of his life story, alongside his work was a treat for the audience. The visit was a long time in the making, as there are numerous ties between Troll and the Vinalhaven fishing community. Many thanks to the Mesko’s for continuing the idea. Thank you also to support from The Island Institute and Grunden’s, for making this possible.